Kauai has many great activities and things to do for children of all ages. Create never ending memories for your children on their incredible vacation. With beautiful mountains, tropical rain forests, rivers & streams, and gorgeous sandy beaches there is most likely more to do here than you will have time for. Plan your daily activities wisely and try to take advantage of the great things to do with your kids listed here on this page. Lydgate Beach Park is a great beach on the East Side (near Lihue). The park includes a playground for kids, picnic tables and a protected area for kids to swim in the ocean. It’s perfect for the whole family to enjoy a safe day at the beach. Wailua River State Park is an excellent place for kids to explore. You can take a boat tour with Smith’s up to Fern Grotto (ages 3 and up). 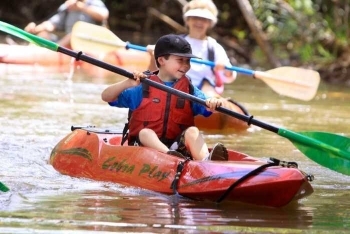 You can also rent some kayaks and take a tour up to hike the Secret Falls (ages 5 and up). Kauai Tubing Adventure is another great activity for kids ages 5 and up. Take a tour through plantation water ditches in the jungle-like atmosphere of Kauai! Ziplining Tour – Experience the backcountry of Kauai! This is great for kids and families to see the Garden Isle from above! For ages 12 and up. Boat and Snorkel tour of the NaPali Coast! This is an all day event (6 hours) and includes a BBQ! For kids ages 2 and up! Waimea Canyon: take a nice relaxing drive to the West Side of Kauai and visit the Waimea Canyon. It is absolutely breathtaking, and on your way back down stop at Jo Jo’s Shave Ice in town for the best on island! This is something the whole family can enjoy together! Helicopter Tours are a great way to experience the beauty of Kauai from above and kids will really enjoy the experience! Ranch Adventure Tours – Get out there and take a horseback tour of beautiful Kauai! Ranch Adventure tours for ages 7 and older. There are so many amazing places to hike in Kauai! Here’s a great Hiking tour to get you around safely to some amazing places. There is also a great place for younger kids at the Kilohana Plantation where you can ride in the train around the property and have a picnic!